Here is a fun bulletin board to celebrate Earth Day or anytime you want to introduce the 5 R's to your students! We often hear about the 3 R's, but adding two more can help dramatically reduce our waste! *Refuse: what can you simply choose NOT to use or buy? This is the most important of all the R's! *Reduce: Use less- save paper to use again, treat materials like pencils and markers carefully and conservatively. *Reuse: Use it again, and get creative with new uses for everyday items. *Recycle: This is the most commonly thought about R, but it's important to make sure that we are only recycling the correct items. Research in your area to find out what's recyclable before completing! *Rot: the R word for composting! Food in a landfill does not break down, so it emits methane gas which is a huge factor in the warming of the earth. Explore starting a compost as a class or school, or sending compost home with a parent. 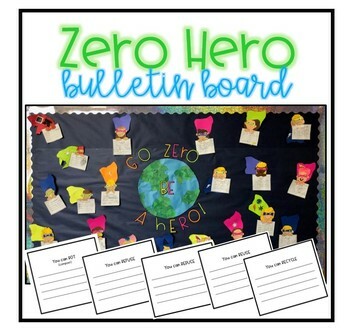 Generate ideas and examples of each R as a class, then students can build their own superhero and write!